Speak Turkish like a pro! Learn how to order your next delicious Turkish dish! Don’t be afraid of the Turkish pronunciation - our recordings will help you master it! Are you ready to get to know one of the most unique languages? Do you want to try something new, exotic and maybe challenging? Taking Turkish language lessons might sound difficult but not with VocApp! 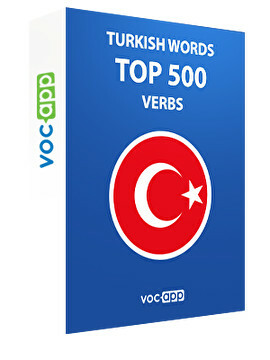 Start to practice Turkish language basics with VocApp! Our language learning app offers you a great opportunity to learn language of beautiful Turkey. VocApp is user friendly and its study methods are proven effective. To make your studies easier and more effective, each word will be combined with an example sentence to show you how to use the word. The course is from English to Turkish, but VocApp also offers courses from Turkish to English – so, something for everyone! No need to search anymore! VocApp’s multisensory learning and flashcards are proven to have positive results. Regularity is important when learning a new language so you can set VocApp to send you a reminder every day at your chosen time – this way you won’t forget to study! Even only 5 minutes per day will help you learn how to speak Turkish! Expand your Turkish vocabulary with VocApp wherever you are! With your mobile device you can take your Turkish lessons at home, at work, in your favourite coffee shop. Study this lessons and learn basic Turkish verbs with examples. They might be useful for your next holiday in Turkey.